This item is the "Stage Plus Series Snake" NSPL8x0-50 (SPL Series), 8 Channel, 0 Return, 50 Ft. with Neutrik connectors. The Stage Plus Series features CL-2 series snake wire along with a low profile 18 gauge steel box, raised edges to protect the connectors, metal "D" style connectors, professional quality strain relief. The wire meets NEC specifications for permanent installation behind walls, ceilings, and floors without conduit (check your local fire code), and will also take the punishment that live bands dish out. We offer all the frequently requested send-return configurations and lengths (special configurations are available, call for details) and the best warranty in the business. 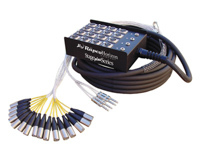 Photo shows generic RapcoHorizon Stage Plus Series Snake 16-4-100, with Amphenol connectors.